Everson Griffen: "They're nice. When the asked me the best part, it's like when you have a good suit on and you put on the perfect tie, that's what the helmet is. It's the tie for the suit. It brings everything together. It makes everything look nice. ... If you feel good and look good, most likely you are going to play good." 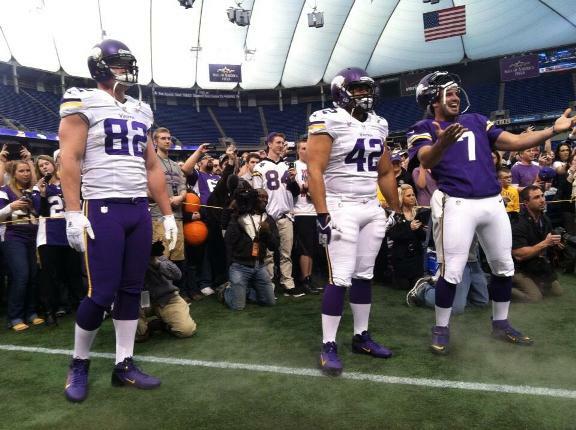 Kyle Rudolph, Jerome Felton and Christian Ponder. Don't worry, Ponder didn't gain weight. Just an optical illusion. In a few minutes, the Vikings will have live human beings running out of a tunnel wearing new Vikings jerseys. We'll update with more pictures when that happens. For now, we have a press release with an image of the new uniforms, modeled by No. 28. Of note: They will also potentially do a purple-on-purple (tops/pants) even though that is not shown. A modern representation of Nordic culture combined with the Vikings long-standing football tradition, the new design provides a modern twist on the classic Vikings uniforms. Features include a matte purple helmet with a black facemask, a refreshed, brighter gold accent, unique new font and numbers featuring curves that reflect the bow of a Vikings ship, and single gold and white stripes on the shoulders and pants reminiscent of early Vikings uniforms. 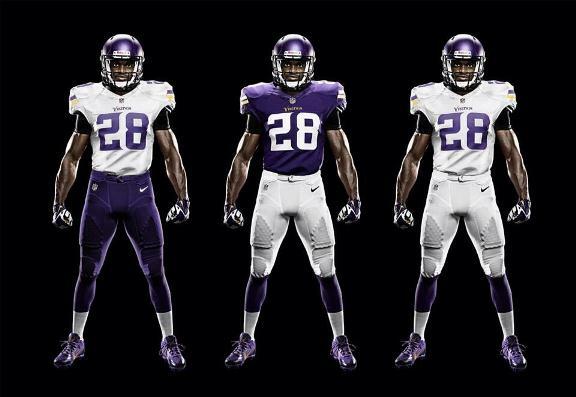 The new uniforms allow for up to four color combinations: white pants, white jersey; white pants, purple jersey; purple pants, purple jersey; and purple pants, white jersey.